Although it is laudable to be able to keep a secret, I don't see any reason to keep these DIY house cleaning products a secret. I am actually busting at the seams to tell you all about them. They are such juicy secrets that I don't think any blabbermouth blogger could keep them to his-or-her-self for very long. Can they help you to save money? Check. Can they help you to dissolve spots and grease on surfaces in your house? Check. And are they environmentally friendly? OK, three out of four are, and the other is a major time saver, and that counts for something, doesn't it? Are you ready to read some secrets? I bet you are. Top secret DIY carpet cleaner: The catch here is that you need to rent a carpet cleaner machine, so let's get that out of the way right now. But say you don't want to use nice and toxic carpet cleaning solution in the carpet cleaning machine, since you are so nice and natural? OK, well then all you need is some OxyClean, vinegar, and warm water. If you are so crunchy that you only use Dr. Bronners to clean your house, I have no idea what to tell you. Just kidding. I totally know what to tell you. Crunchy companies like Seventh Generation make oxygen laundry boosters, so just sub a crunchy-brand laundry booster for the OxyClean and then hide the rest of it from the other members of your co-op. They will never know that it wasn't Bronners, and they will love the clean carpet. I just told you to cheat and lie, but it is for the good of your carpet. It is for the greater good! Super secret actually crunchy lemon cleanser: Nicole from the blog WonkyWonderful concocted this elixer of cleanliness. If you are of the "all natural, all the time" school of life, then pull up a chair and have a listen, because this super secret recipe will disinfect your entire world. 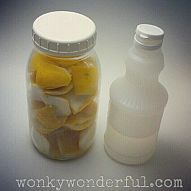 You basically pickle lemon peels in white vinegar, and then strain the vinegar and dilute it with water. This would be exceptionally fun for people who make such fermented wonders as kombucha and kimchi. Rock on, picklers of the world. Rock on. Classified info: Frugal tub scrub: Sssshhhh. Don't tell. You can scrub your tub with a paste of baking soda and dish soap. The big reveal is ceramic tile sparkle: Let me explain to you that I have met tile contractors from Cincinnati and professional house cleaners from every corner of the globe, and none of them could make tile sparkle like this one weird tip. This tip comes from Rebecca from YouAreTalkingTooMuch.com (seriously, that is the name of her blog). Clean hardwood floors and ceramic tile with...drum roll please...Windex. I told you, one of these is not like the others. You would not believe how sparkly and shiny the Windex makes surfaces other than windows. Nobody paid us to say that. I am telling you this secret purely for your cleaning ease. Now get busy cleaning. 2013 will be your year to keep a cleaner, more glittering house.